Situated in an extraordinary environment, two hours south of Auckland along a unique peninsular. Close to some of New Zealand's beautiful coastlines and surrounded by native bush. A composite school: Year 1 – 13 (5 – 18 years old) that has an energetic and cheerful atmosphere. Students are supported to be their very best academically, as well as in sports, cultural and social activities. Special programs: Marine Academy, Marine Sciences, Outdoor Education, The Plane Build Project and Engineering Projects. Students enjoy a safe and inclusive environment for learning in well-maintained and highly functional facilities. The number of students staying at school to gain appropriate qualifications that are aligned to their career pathways has increased. Many innovative vocational opportunities such as marine and industry-based programmes, support student retention, interests and career planning. International students achieve well at the school. Students are encouraged to participate in school activities. There is a strong focus on ensuring students’ wellbeing and pastoral care. Student progress is well monitored and appropriate support in planning their learning pathways is provided, including ESOL support. The school ensures each child has every opportunity to achieve their very best. For this to occur in a busy school, it requires dedicated, professional teaching staff. Mercury Bay Area School has well-organized and integrated curricula plans, a positive supportive pastoral care environment and energetic, cheerful young people who want to achieve their highest potential academically as well as in sporting, cultural and social fields. The school is able to offer top quality learning programmes designed to meet the needs of its diverse student population, so that every student is studying and being assessed at their appropriate level. The schools major focus is on student achievement. Their positive, caring and supportive learning environment enables each child to develop mentally, physically, socially and emotionally. The school knows that there are several elements needed to develop well-rounded young people. The array of sporting and cultural opportunities offered within this school is extra-ordinary and is one of their strengths as an Area School. Their students have a real sense of belonging within their community while also being part of an integrated education programme. The school is committed to develop the whole individual, and for this to occur they need staff and community support underpinned by strong family support. The class sizes are small and they are able to offer a diverse array of quality learning programmes into our senior school, leading to NZQA qualifications (NCEA). Roll 890 to 920: There are currently 22 international students, who add further diversity to the school’s community. Promotes the development of academic, physical, cultural and personal skills to the full potential of the individuals concerned. Recognises the needs, rights, individuality and integrity of students and staff. Encourages all involved to work together to ensure that the educational experiences of children are positive, relevant and enjoyable. The charter is a key planning document that sets out the school's objectives and targets for the year, and establishes the mission, aims, objectives, directions and targets of the board that will give effect to the Government’s National Education Guidelines and the Board’s priorities. MBAS is located about 2.5 hrs drive from Auckland along the spectacular Pacific Coast Highway and within close proximity of Hamilton, Rotorua and Tauranga. Mercury Bay is one of New Zealand's premier destinations, offering endless opportunities for fishing, boating, surfing and swimming. The richness of the surrounding agricultural areas and the unique out-door pursuits they provide for makes for a very diverse landscape indeed. Located on the east coast of the Coromandel, Mercury Bay’s main town of Whitianga has attracted visitors for more than a thousand years, since Maori explorer Kupe first settled here around 950A.D. But it was Captain James Cook who gave the area its name, when he anchored in the bay in 1769 to observe the transit of Mercury. Now an established tourist resort, the Bay’s spectacular coastline is dotted with islands and its relatively sheltered waters are perfect for all water sports. 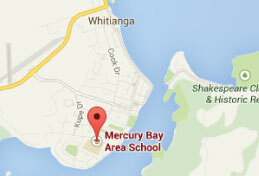 Mercury Bay Area School A student advisor will be in contact within one working day.